Almost as popular as the maid of honor or best man, the Tweetmaster or Tweeter of Honor is becoming a normal addition to bridal party lineups. This is a tech savvy person that can document your wedding from your perspective or just on your behalf. You said 'YES' and you want to tell the world, right? Well remember that some of the world may appreciate hearing about your major life milestone directly from you, either in person or on the phone. When I got engaged I first called both sets of parents, which sparked a phone tree to all aunts and cousins. My fiancé and I each called special relatives over the next few days and surprised a few friends at dinners the following weekend. After about two weeks, we finally made the news Facebook-official to share with the world. Family and closest friends truly appreciated being given the chance to share in our celebration and, for newly engaged couples, it's really fun to play the game "do they see the ring yet?!" The "pause-before-sharing" rule should also be applied throughout the planning process. As a general rule of etiquette, always consider the feelings of the audience. Things that fall under the don't-post category include: your bridal party selections, your wedding website and anything about price and budget. 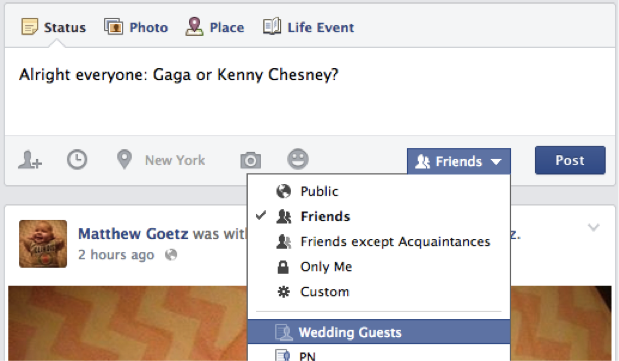 Tech savvy tip: Create a list in your 'friends' section and title it 'wedding guests'. Then when you start to post about playlist requests or instructions to the flash mob, you won't make enemies. If you've made the decision to document your wedding on social media, it's best to create your hashtag as early as possible. Include it as you ask friends to be in your wedding and share it on shower and bachelorette party invitations. If you start to incorporate the hashtag phrase early, people will use it to capture any activities related to your big day (for example: going shopping for their dress, baking cupcakes for your shower, etc). Just remember that Instagram is a public search engine and anything with that hashtag can and will be seen by friends and friends-of-friends. Not sure if you want to use a hashtag? Consider these risks from The Knot before deciding. 4. #Awesomepics - Now what? As many social media users are aware, Instagram photos can't be saved to your photo library unless you take a screenshot of the post. Luckily there are many fabulous aggregator apps (like Wedding Party, Appy Couple, Capsule and Wedpics) that allow you to create an app, invite guests and allow everyone to upload all images and video from the wedding to a single location. These are definitely beneficial and highly recommended if you are incorporating social media as an integral part of your wedding experience. Almost as popular as the maid of honor or best man, the Tweetmaster or Tweeter of Honor is becoming a normal addition to bridal party lineups. This is a tech savvy person that can document your wedding from your perspective or just on your behalf. The TOH could be used in addition to or in replacement of asking all guests to post, especially if your crowd is not so tech savvy. It still allows for your wedding day to be documented to the masses but in a slightly more controlled fashion. The only other vow you need to take on your wedding day: You shall not have your phone on you! The day goes by so quickly and it's quite a rare occasion that you're surrounded by all your closest friends and family, so find peace in the fact that you hired someone (and possibly even assigned someone) to capture the day on your behalf. The only exception to this rule is an awesome newlywed #selfie. In order to successfully include social media into your wedding, you need to provide direction and expectations. It's one thing to want your friends to post funny pictures that you normally would not see but it's another to have a sea of iPhones and iPads attempting to capture your walk down the aisle (also a nuisance to your paid photographer). Here are two examples of phrases to include on your wedding website and/or ceremony program. We are so excited that you've joined us on this special day. We want you to be present during the ceremony and ask that you refrain from taking pictures. We have hired professional photographers to capture these memories and request that all phones and cameras are turned off until the reception. We are so excited that you've joined us on this special day. Feel free to capture this day on your cameras and phones. Our only request is that you wait to post any photos until the reception, allowing us the honor of posting our first pic as husband and wife (#selfie). We found some other awesome copy & paste phrases to help set these expectations at Offbeat Bride. 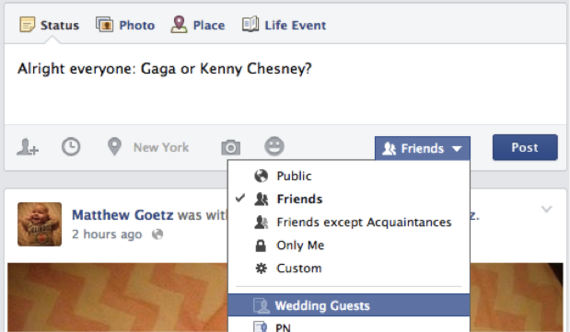 Are you a guest of a tech-friendly wedding? Click here to brush up on your social media manners. Author: Amanda Goetz is the Founder and CEO of Availendar: a site helping brides and planners access the availability calendars of reputable vendors in the event industry. Availendar is currently in beta and being rolled out in NYC to brides, planners and top vendors in the industry.